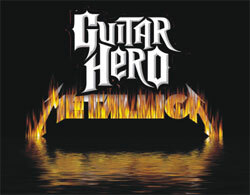 Guitar Hero Metallica | OhGizmo! Music games may look geeky to those who aren’t into video games or music. Even if you have friends who don’t like to play the drums, sing, or play guitar in a virtual band, at least they can sit around and make fun of you while you rock out. Guitar Hero fans that have been waiting for the next title in the franchise, Guitar Hero Metallica, to launch can now get a taste of what the full game will offer with the playable demo for the game now available on the Xbox Live Marketplace.